A Value added course module I on “StaddPro.V8i” organized by Department of Civil Engineering through Excel continuing education cell from 16.06.2015 to 22.06.2015. Student won Second prize in the paper presentation on KSHETRA 2KI5 29 September 2015 at KSR college of Engineering,Thiruchengode. Student participated in the Technical Quiz on KSHETRA 2KI5 on 29 September 2015 at KSR college of Engineering, Thiruchengode. Student won Second prize in the National level Workshop on “Green Concrete” on 10 September 2015 at Surya Engineering College. Commencement of the Classes for 2014-2015 Batch Students of Civil Engineering held on 01st August 2014. Department of Civil Engineering is celebrating "Engineer's Day" on 15th September 2017 at Excel Campus. 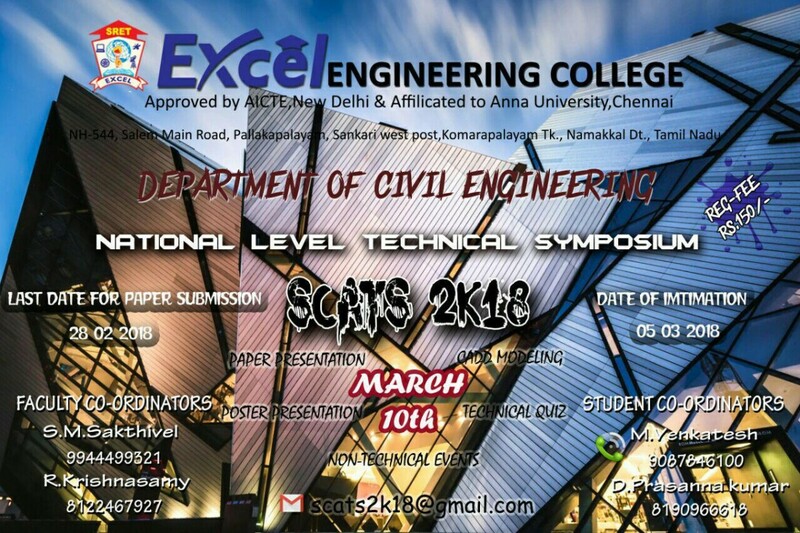 Department of Civil Engineering has organized "SCATS 2017" a National Level Technical Symposium on 22nd March 2017 at Excel Campus. Excel Engineering College - Department of Civil Engineering has organised a "Two Day Workshop on Bridge Design" on 25th & 26th August 2016 at APJ A/C Hall. Excel Engineering College - Department of Civil Engineering is organizing "Campus Connect" Programme on 27th February 2016. Excel Engineering College - Department of Civil Engineering has organized seminar on "Light weight concrete blocks" on 24.02.2016 at APJ Hall, Excel Campus. 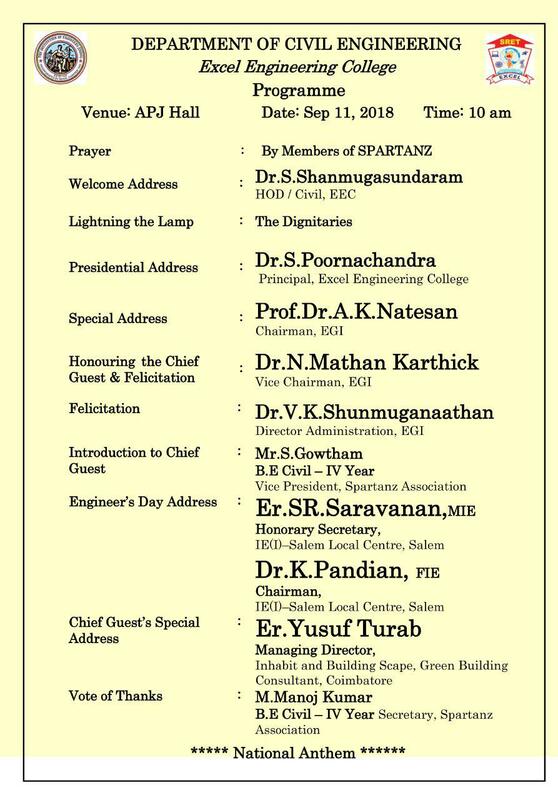 Excel Engineering College - Department of Civil Engineering organizing Association Inauguration " Spartanz" on 04/07/2015 @ Pavayammal Hall. Industry Explorer of Department of Civil Engineering, Excel Engineering College held on 28.02.2015 @ Excel Campus. Anna University Sponsored Seven days Faculty Development Programme on Strength of Materials held from 8th December 2014 to 14th December 2014. Association Inauguration of Civil Engineering held on 22 July 2014 @ Excel Campus. 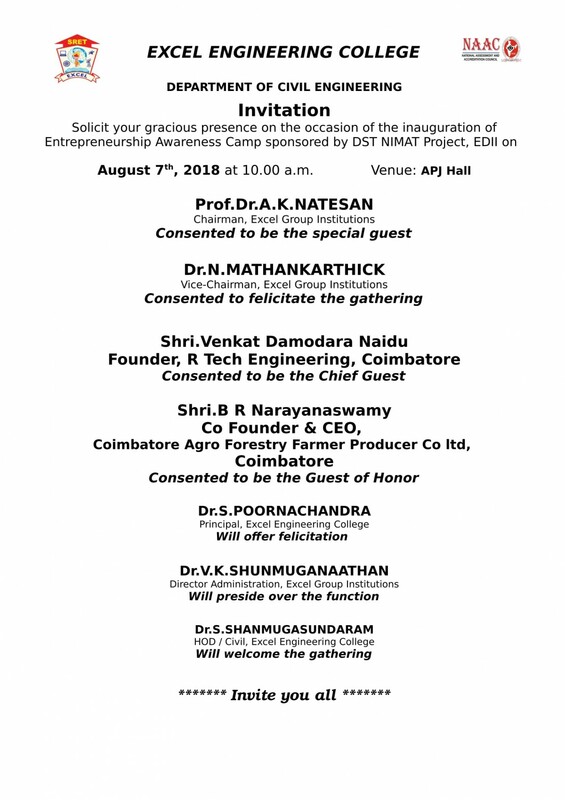 First Year Inaugural function On 09-08-2013. 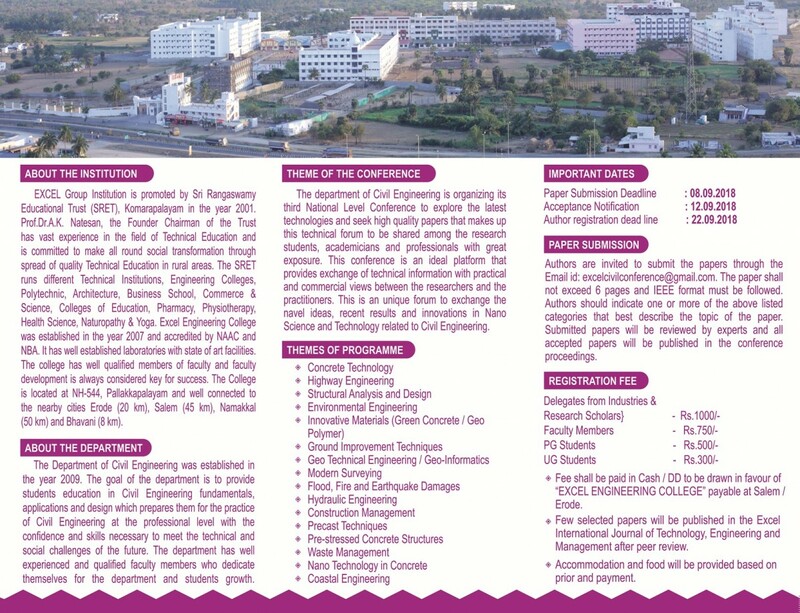 Second National Level Technical Symposium “ZIVILST’12” Programme of Department of Civil Engineering held on 05.09.2012. Department of Civil Engineering Organized Faculty Development Programme on "Design of Steel Structures" on 29.08.15 at Velalar College of Engineering & Technology. R. Mohanraj, AP/Civil, Attended Workshop on “Soil Health for sustainable future (SHSF – 2015)” at Periyar University, Salem on 03 December 2015. R. Praveen Kumar, Attended Workshop on “Soil Health for sustainable future (SHSF – 2015)” at Periyar University, Salem on 03 December 2015. R. Mohanraj, AP/Civil, Attended Workshop on “Building Information Modeling Using Autodesk Revit 2015” at Amirtha viswa vidhyapeetham , Covai on 23 .11. 2015 to 27.11.2015. M.Tamilarasi,AP/Civil, Attended Workshop on “Soil Health for sustainable future (SHSF – 2015)” at Periyar University, Salem on 03 December 2015. Civil Engineering Staffs Attending FDP Workshop at TNEB, K.R. Thoppur, salem on November 18, 2015. Keynote Address by Mr. M.Umasankar, Senior DGM & Head Quality, Buildings and Factories I/C, L & T Construction, Chennai. Lighting of Lamp by Mr. M. Velayutham, Engineering Design Manager, CADS Software India Pvt Limited, Coimbatore. Presidential Address: Hon. Chairman Prof. Dr. A.K.Nateasan, Excel Group Institutions. Our Civil engineering students went along with faculties to the site visit to the college hostel building during construction for the academic year 2015-16 to gain the practical oriented knowledge in due respect.